Ojo Caliente is tiny community in Taos County, New Mexico where people visit to enjoy mineral hot springs. Ojo Caliente means “The Hot Eye” in Spanish. The water hole is hot. Get it?! OK, reach it along US Route 285 between Espanola and Taos; 50 miles North of Santa Fe. We drove through the place in an eye blink on the way to and from Colorado on our recent road trip. Considering that I had my own budding artist named Raphael in the minivan, it felt apropos to stop and snap this fading mural. It’s on the south side of the street, on the north facing wall of a one room building that could be a residence. The mural is a mirror opposite copy of part of the well-known oil painting named, Sistine Madonna [The Madonna di San Sisto] by the Italian artist Raphael Sanzio da Urbino. He depicted the winged angels beneath Mary in the painting shortly before his death, ca 1513-1514. 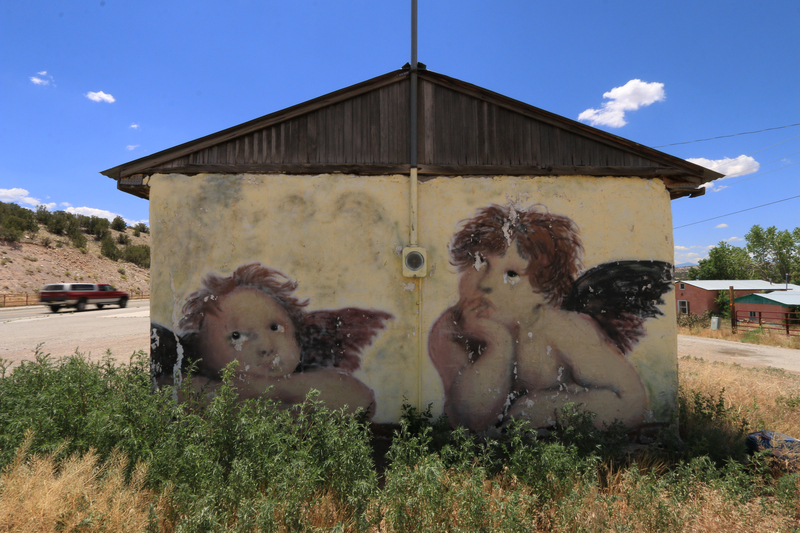 If you are a lover of religious iconography, you will find a colorful rendition of La Madonna on the north side of the road, a thousand feet or so from the site of my shown subject. She is painted on a south facing wall.